Facebook Live is really taking off right now. The ability to stream live right from your smartphone is certainly becoming a hit. If you’re representing a business then you should be looking at ways to stream and get the rumoured extra reach that Facebook will give you for using its new baby. Facebook Live is a simple idea coupled with some not-so-simple tech that gives EVERYONE to chance to broadcast right now… even if they’re a total muppet in front of the camera. My recommendation would be that you Go Live for a reason and have something to say or something interesting to show your viewers. If you have something to offer the internet (and let’s face it, you must have!) then get to it and share your tips, advice, story or news. It really does gain you some great exposure and I’ve shared loads of tips on giving a great broadcast right here. But after you broadcast there’s more work to be done. Re-purposing your content is something all good marketers work on constantly. The good news is, when you re-purpose what you’ve already done, you have much less work to do on the whole. Right, before we get clever, let’s get basic. If you go live and you’re happy with the content then you’ll hit publish, right? 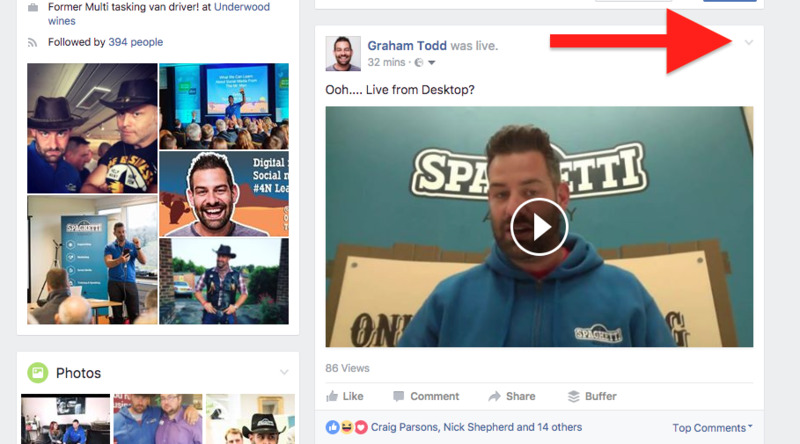 Now you can share the broadcast on your Facebook later on, or on your business page or on your groups that you engage with. Whenever I go live for Claire and Todd on the Sofa I spend a few minutes actually sharing the video live so that it’s effectively live in other groups and timelines. But you don’t have to do this live (although it’s cool if you do – you can do it after the event too. Claire and I go ‘Live at 10:45’ when most people are probably too busy to watch. We do get a good reach and lots of live viewers… but I know I get more when I share it later on. So that’s exactly what I do. I’ll re-share the Live stream later in the day on my timeline and on my Business Page. All you need to do is click ‘Share’ from the bottom and then select ‘Share…’ and post to your timeline or your page or group and share it in there with a little intro to say why you’re sharing it. Adding your Live broadcast to a blog is good on two fronts. 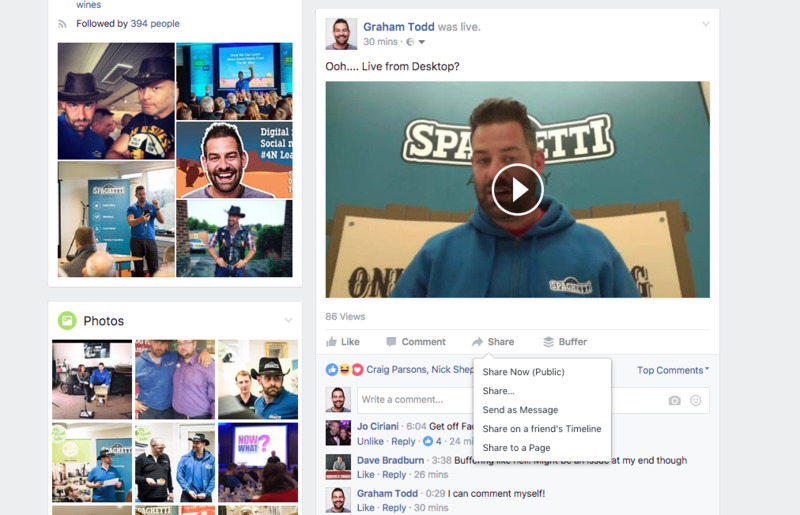 Facebook videos are a really great way to add some media to your blog and mix it up a little. Google looks for video clicks and actions on a page to indicate if your site is liked by visitors. In theory adding embedded media like this will help your blog get some Google attention. Embedding your broadcast in blog is really easy. Copy the code and paste it into your blog with the embed function there (on WordPress simply paste it when you’re viewing the ‘Text’ view). And that’s it. Now you have your Live stream in your blog and you can share the content as a post on your website. This way you’ll get more eyes and more views. 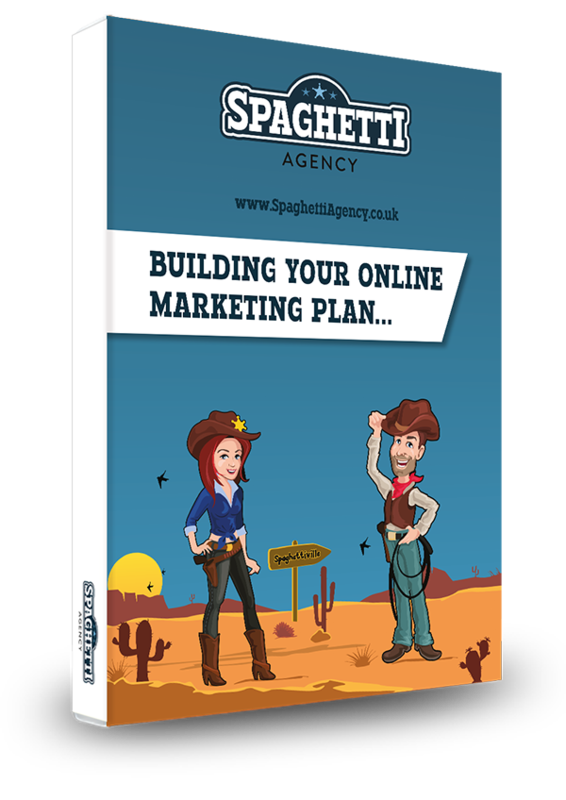 But also if you direct people to your website to watch it you’ll gain more traffic to your website (rather than your Facebook) which should always be your aim. After you share your content you can of course use the video to share on YouTube too. I would recommend doing this too. Think about it: your audience may find you in different places but you have all the best content on your Facebook Page. Why not put the content on YouTube as well? You might just gain some extra views and attention there too. On your mobile, after you stream, you can simply save the video to your device and then upload it right to YouTube via the YouTube app. Don’t forget to pop in the right wording and tags so people can find your topic. If you’ve streamed from your desktop (which is rolling out to users at the time of writing this), or your forgot to save your video to your phone, then you have to work a little harder to get the file. You’ll need to head over to your Facebook Live post, change the start of the post URL to m.facebook.com and then you can ‘Save us’ by right clicking on your post. Now you have an MP4 which you can share to YouTube… or anywhere to be honest! 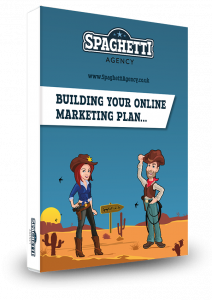 Re-purposing content should be the aim of any marketer. Not all your audience or fans will find you or interact with you in one place. The holy grail of re-purposing is to create one piece of content and turn it into video, blog, posts, podcasts and wherever else you have a channel. But… we all have lives and businesses to run. We’re busy people. 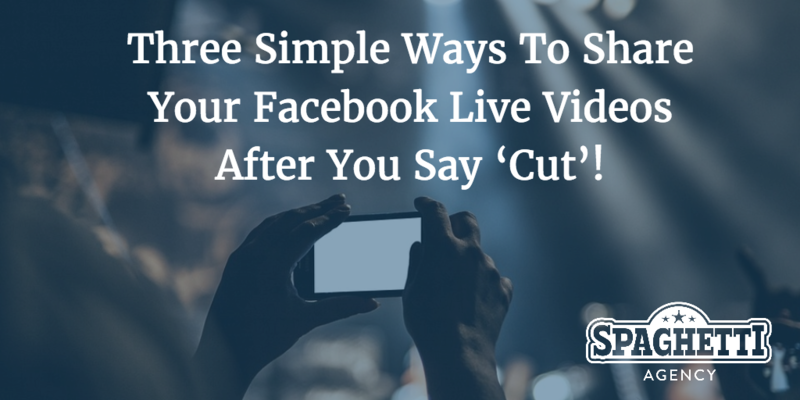 Just sharing your Live video elsewhere is simple and easy to do and might even help you get found online more too. Try it, and let me know how you get on! I LOVE questions. Hit me up in the comments below and let’s discuss Facebook Live. Yeehaa! That’s awesome. Be sure to share it with me when you do!